Author(s): Mariola Chudzik, School of Pharmacy with Division of Laboratory Medicine in Sosnowiec, Medical University of Silesia, Chair and Department of Physical Pharmacy, Jagiellońska 4, 41-200 Sosnowiec, Poland. Joanna Równicka – Zubik, Jadwiga Pożycka, Bartosz Pawelczak, Anna Sulkowska. 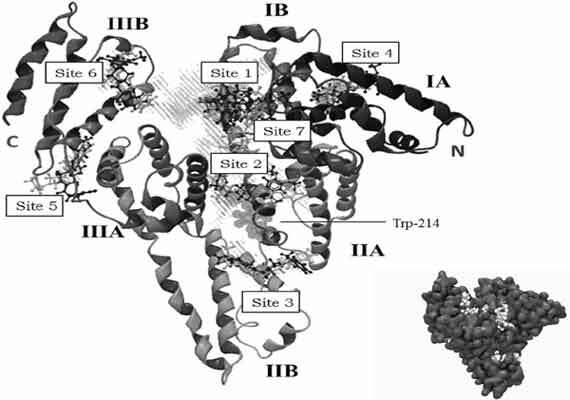 Structural changes of human serum albumin (HSA) caused by old age and coexisting diseases result in differences in the binding of doxazosin (DOX). DOX is a postsynaptic α1- adrenoreceptor antagonist used for treatment of hypertension and benign prostatic hyperplasia. In elderly people suffering from various renal or hepatic diseases the significant portion of N-form of human serum albumin (normal) is converted to A-form (aged). The differences in binding of doxazosin to N- and Aform of albumin are an important factor, which may determines therapeutic dosage and toxicity of the test drug. To indicate these differences, the technique of fluorescence spectroscopy was used. The association constant (Ka) obtained from fluorescence quenching demonstrated that doxazosin has higher affinity for AHSA than for HSA. In order to describe the cooperativity in binding process, the values of the Hill’s coefficient has been analysed. For DOX-HSA system (λex 295 nm) Hill’s coefficient is close to 1 and it indicates that there is a single class of binding sites. For DOX-HSA (λex 275 nm) and DOX-AHSA (λex 275 nm and λex 295 nm) systems we observed positive cooperativity (nH>1). A greater red shift of fluorescence emission maximum of AHSA than HSA in the presence of DOX was observed. This suggests that the binding of DOX to AHSA was accompanied by a stronger increase in polarity around the fluorophores in comparison to HSA. The binding interaction between DOX and HSA has been also studied by molecular docking simulation. Keywords: N-A transition, molecular aging, human serum albumin, doxazosin. Affiliation:School of Pharmacy with Division of Laboratory Medicine in Sosnowiec, Medical University of Silesia, Chair and Department of Physical Pharmacy, Jagiellońska 4, 41-200 Sosnowiec, Poland. Keywords:N-A transition, molecular aging, human serum albumin, doxazosin. Abstract:Structural changes of human serum albumin (HSA) caused by old age and coexisting diseases result in differences in the binding of doxazosin (DOX). DOX is a postsynaptic α1- adrenoreceptor antagonist used for treatment of hypertension and benign prostatic hyperplasia. In elderly people suffering from various renal or hepatic diseases the significant portion of N-form of human serum albumin (normal) is converted to A-form (aged). The differences in binding of doxazosin to N- and Aform of albumin are an important factor, which may determines therapeutic dosage and toxicity of the test drug. To indicate these differences, the technique of fluorescence spectroscopy was used. The association constant (Ka) obtained from fluorescence quenching demonstrated that doxazosin has higher affinity for AHSA than for HSA. In order to describe the cooperativity in binding process, the values of the Hill’s coefficient has been analysed. For DOX-HSA system (λex 295 nm) Hill’s coefficient is close to 1 and it indicates that there is a single class of binding sites. For DOX-HSA (λex 275 nm) and DOX-AHSA (λex 275 nm and λex 295 nm) systems we observed positive cooperativity (nH>1). A greater red shift of fluorescence emission maximum of AHSA than HSA in the presence of DOX was observed. This suggests that the binding of DOX to AHSA was accompanied by a stronger increase in polarity around the fluorophores in comparison to HSA. The binding interaction between DOX and HSA has been also studied by molecular docking simulation.